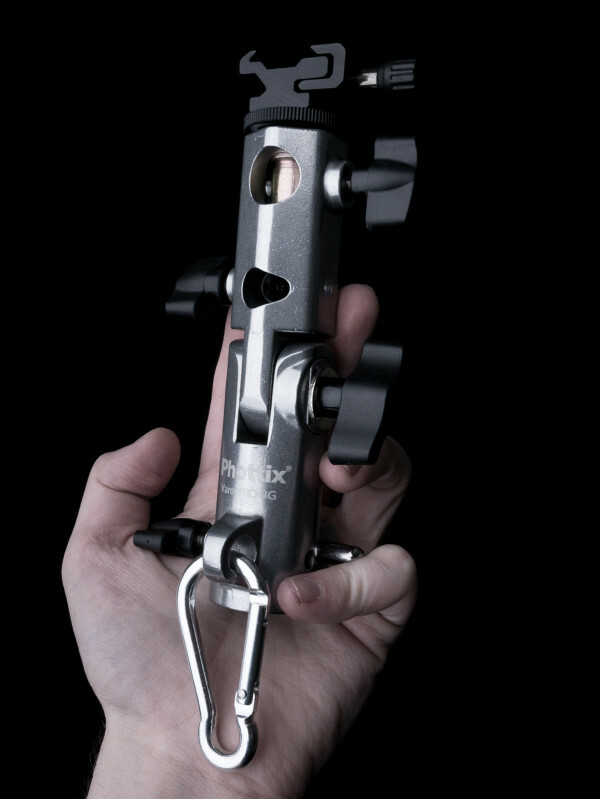 Imagine every feature a photographer could possibly want in an umbrella bracket. That's the Phottix Varos Pro. Is it any good? It is not that easy to get excited about flash brackets. Most of them are designed to do the same sort of thing, so what could a new one have to offer? From my experience, every swivel adapter I have bought is a compromise in one way or another. Some only hold flashes securely with a screw-lock hotshoe or don’t hold anything securely at all. Some take spigots and others only mount on tripod threads, some aren’t big enough for all the umbrellas, some aren’t strong enough for heavier flashes. With a mishmash of different adapters I then have to hunt for the right one, and all I wanted to do was stick a flash on a stand. No wonder portable studio lights, with integrated triggers, batteries brackets and accessory mounts, are becoming ever more popular. 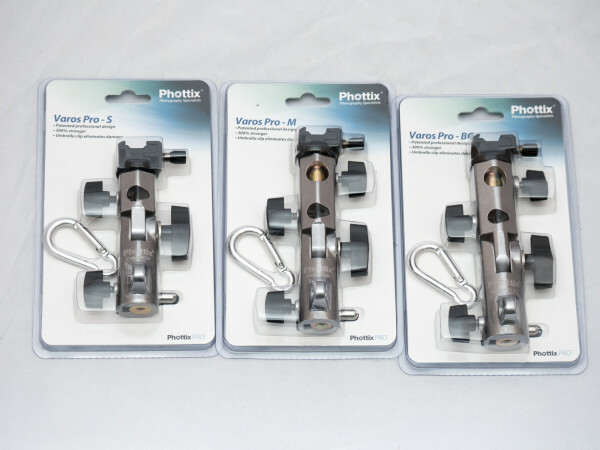 Phottix wants to make your life easier by offering one bracket, the Varos Pro, that does everything properly. Well, actually three, because there are different sizes. Phottix’s distributor, Mac Group Europe, were kind enough to send me a set to try for myself. 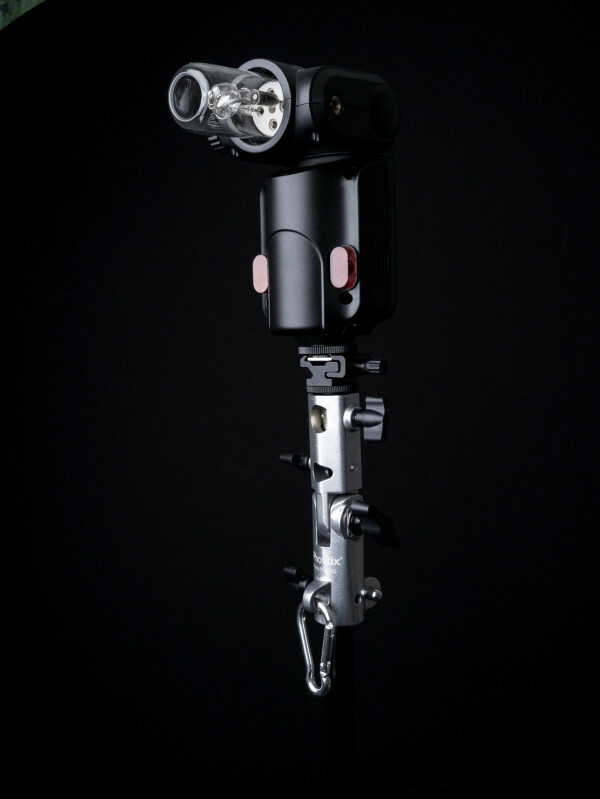 The Varos Pro S has a 1/4-inch tripod mount on top, whereas M and BG models have removable spigots. The latter can be mounted horizontally to bring the flash closer to the centre of the umbrella. They have different load capacities. The manufacturer specifies 25kg, 28kg and 30kg for the S, M and BG, respectively. If you’re using any sort of flash with an umbrella then I can’t see your load reaching anywhere near these levels, though it might come into consideration if you attach an HS Speed Mount or some other accessory adapter with a large softbox and a heavy-duty flash (e.g. Godox Witstro). The S is smaller (obviously). The M and BG are a similar height but the BG is a little bit beefier. They are all made of metal, though, and generally feel a bit over-engineered. The knobs are plastic but should be easily replaceable if they wear out. Everything else seems to be pretty much the same throughout the Varos Pro range. 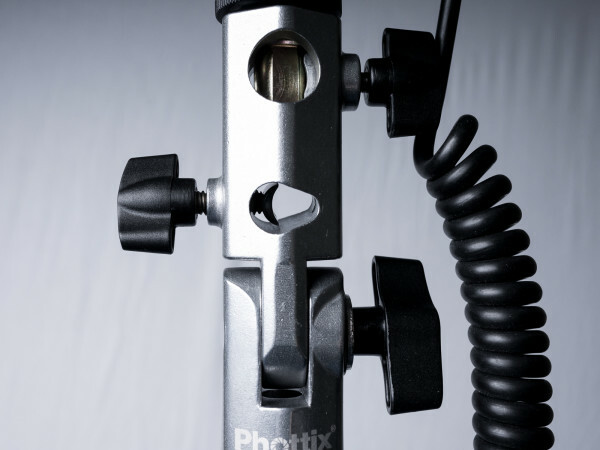 According to Phottix, these latest brackets have a number of patents on parts of the design. One of these is a spring-loaded clamp that keeps the bracket from falling off your stand, even if the tightening nut is loose. Having used brackets with this feature in the past, I feel like any studio light or swivel bracket that lacks one is inferior. To unlock, simply press the button with your thumb and it comes free. There is also an umbrella clip that doesn’t dent umbrella shafts, because it has a rounded grip that wraps around the shaft instead of a pointy screw that pokes into the middle of it. The umbrella holder itself is slanted 8 degrees to compensate for the height of your flash. This does mean there is a right & wrong way round. All three brackets have a lanyard hole, and a carabiner comes in the box, letting you hang battery packs, triggers or ballast securely. Everything seems to work pretty well and these certainly feel like very solid bits of equipment, built to last. I might say they are actually a bit heavy, but this is probably more reassuring than cumbersome. So how do these compare to other brackets I have used in the past? 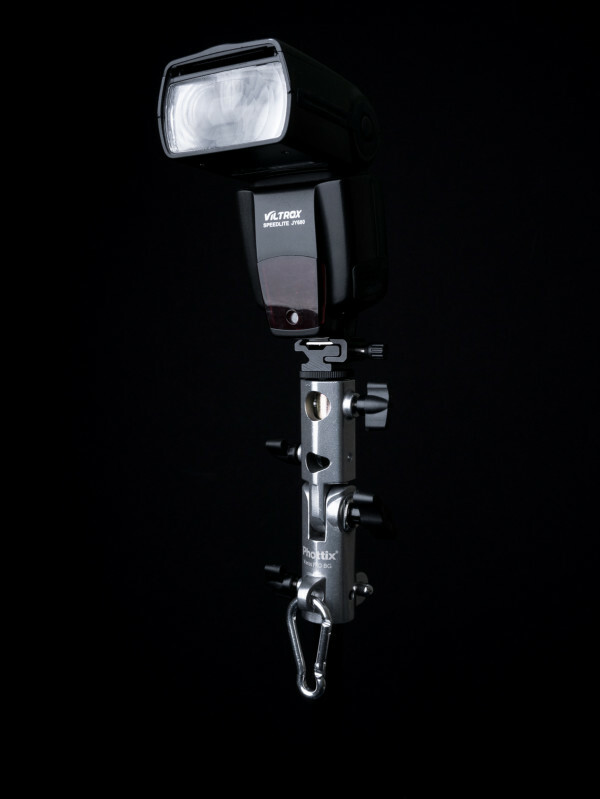 The removable spigots and included cold-shoe adapters let you mount any sort of light on here, from a standard shoe-mount speedlight to a beefy bare-bulb Witstro flash. You can also mount them on any stand, or on a tripod if you want, or on a super clamp or other grip accessory if you have one. Most other bracket don’t have a locking button, which is by far my favourite feature of the Varos Pro. It is effectively an idiot-proof insurance measure. Who hasn’t forgotten to tighten all the knobs on their light stand before? It’s like having a safety pin on a grenade, or a cover over the nuclear launch button. This feature is by no means exclusive to the Phottix Varos Pro: you can find it in various generic $11 brackets, sometimes called “Type D” on eBay, and in the CotswoldPhoto-brand flash adapters (£10), though those cheaper products don’t have some of the other Varos Pro features, like the slanted, safe umbrella clamp or the removable top spigot. 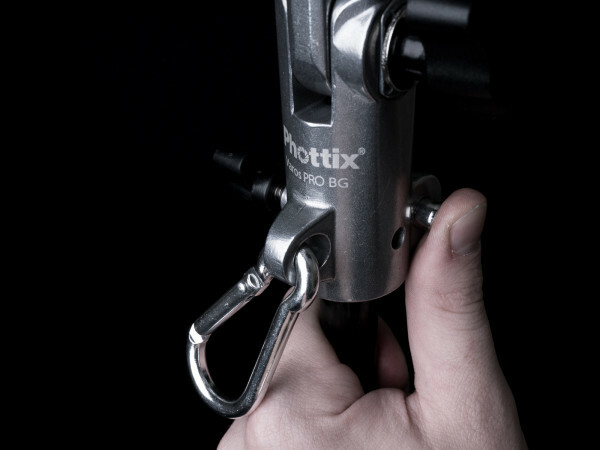 Phottix doesn’t make clear if the auto-lock is one of the features they have patented. Some of the small brackets I have used in the past were the ultra-cheap mini-ballhead style ones, which even Phottix sells as the US-A2. These are nifty, and cheap, but generally not strong enough to hold anything but the lightest equipment. By contrast, the Varos Pro feels like it could hold anything I could care to put on it. The Manfrotto Lite Tite is slightly cheaper than the Phottix Varos Pro, has removable spigots and nice big tightening handles, but not an auto-lock, a lanyard hole or a shaft-friendly umbrella clamp. So then, it looks like if you want every feature possible in an umbrella bracket that will do everything, the Phottix Varos Pro could be the product for you. All three models are sturdy and well-made, with the versatility to work with any kind of stand or light mounting interface. However, their solid construction does make them quite heavy, and if you need a lot of brackets then the £25 unit price could add up quickly. I am not sure if everybody would want a Varos Pro for every one of their stands for all situations — I don’t always use umbrellas and battery packs, for example. Rather, I might recommend getting a couple of these for general use, then investing on some more specialised equipment for other applications. In particular, you aren’t always going to need a 30kg load capacity, except possibly when mounting very large light modifiers. But Phottix’s system for fitting softboxes to hotshoe flashes is far from optimal in my eyes: they want you to invest in an HS Speed Mount II (£70), attach this apparatus to your Varos Pro (£25), then fit your Bowens S-fit studio accessories to the whole setup. Far cheaper, less unwieldy and simpler to use would be the £15 Godox S-fit adapter, which is an umbrella swivel, light stand adapter and Bowens S-mount all in one elegant (though less modular) package. So it depends on what sort of variety of shooting and lighting you need to do. 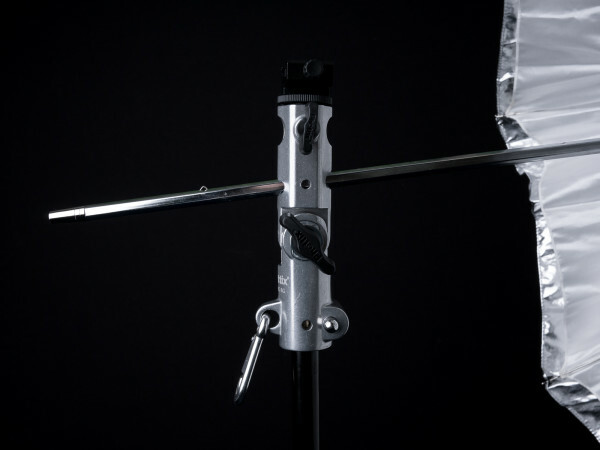 But if you do need a solid umbrella bracket, with the Varos Pro you can’t go far wrong. 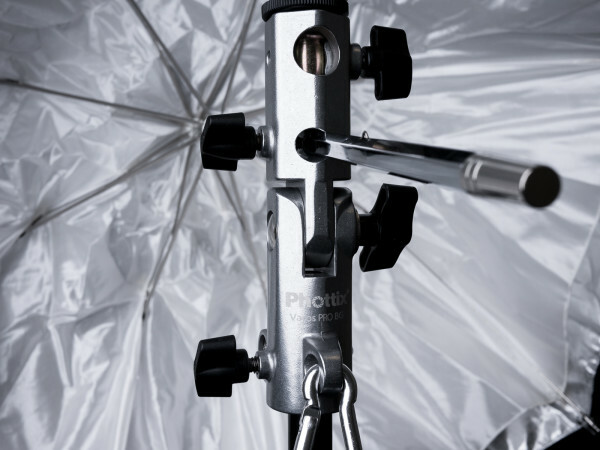 The Phottix Varos Pro umbrella brackets are distributed in the US and Europe by Mac Group. Phottix Platinum dealers £25 including VAT.